This entry was posted in FR and tagged nouvelles on May 31, 2014 by FEMEN. This entry was posted in DE and tagged nachrichten on May 30, 2014 by FEMEN. This entry was posted in ES and tagged noticias on May 30, 2014 by FEMEN. לא רק אורטל: נשים שהתפשטו למען המטרה An error occurred. This entry was posted in IL and tagged חדשות on May 29, 2014 by FEMEN. This entry was posted in ES and tagged noticias on May 29, 2014 by FEMEN. This entry was posted in IT and tagged notizie on May 27, 2014 by FEMEN. 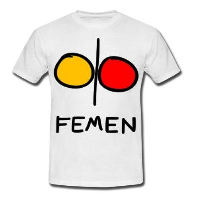 This entry was posted in FR and tagged nouvelles on May 27, 2014 by FEMEN. This entry was posted in ES and tagged noticias on May 27, 2014 by FEMEN.